Greetings everyone, my name’s Mitch, and I’m an avid Magic player from Denver, Colorado. I’ve dabbled in Standard, Modern, Legacy and various Limited formats; however, I fell in love when I build my first EDH deck. EDH became one of my favorite ways to play Magic, and I still drive down to my local game store every Thursday night to play. This series focuses on various deck building strategies and specifically how to use EDHREC as a resource during the process. My goal in this article is break down an EDH deck into its component parts and walk you through my process of building a deck from the ground up. I want to show the most effective tools and methods I discovered and provide examples of how to implement them throughout the building process. I call my deck building strategy Pyramid Theory, which is my spin on the conventional idea of top-down deck design. Top-down deck design has been talked about by various members of the magic community ad nauseam, but my goal with Pyramid Theory is to tailor top-down design specifically for EDH. 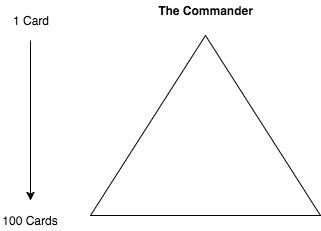 Essentially Pyramid Theory is a diagram of how a commander deck evolves from beginning to end. The principal idea of Pyramid Theory is that an EDH deck begins with a single card. From that single card our ideas will flow. It begins with a just few key strategies, and these begin to become established themes that diversify and strengthen our deck. With this method I hope to establish a framework that players can use to improve their own deck build skills, and refine decks that they have already created. To begin a deck we need a source of inspiration. This source of inspiration can be many things. It could be a single card, a combination of cards, a color combination, or even a mechanic. For basic Pyramid Theory we begin with a single card; our commander. Choosing the commander is typically the beginning of a deck’s journey. Once you see a commander that ignites your imagination it becomes the bedrock of your deck. The commander sits the top of the pyramid and is the single card that inspires and guides the deck building process. It serves to consolidate themes, provide utility, and, at times, win the game. You want to select a commander that you feel passionate about. If you need help picking a commander, I highly recommend poking around EDHREC for a while, keeping in mind the colors and play styles that suit you. Since I’m building a Commander deck from the ground up, so I too will need a source of inspiration. I’ve wanted to build a blue/green (Simic) deck for awhile now, and we were just introduced to two new Simic commanders. After looking at both Kydele, Chosen of Kruphix and Thrasios, Triton Hero, I was inspired to build a new deck. Both commanders are powerful, and feel like they were meant to be played together. They can fuel each other’s abilities, and literally have the word “partner” printed on them. Once I saw these two cards I was hooked, and all the possibilities for the deck were buzzing around my head. This kind of inspiration is all you need to begin crafting a deck using Pyramid Theory. You just need to find one card that gets the creative juices flowing. Once inspiration has struck, the next step in Pyramid Theory is to identify some goals for the deck. We want to evaluate what our commanders want to do, and what it needs to be powerful. We should create some goals that will aid and accentuate our commander’s abilities. Another aspect of goal setting is understanding the restrictions, such as budget, or even meta-game restrictions. These are important to establish from the beginning, before we add any cards to our list. If you have a budget in mind you may want keep many of your cards to under a dollar, or look for cards that are cheaper alternatives to the often expensive commander staples. While building we may also want to plan for a particular meta-game. Your playgroup may be more competitive than others, so you may want to avoid cards that have a higher converted mana cost. Alternatively people in your playgroup may be playing a lot of graveyard-based decks, so some graveyard hate may be necessary. These are just a few things we should keep in mind as we establish our deck’s goals. For this Kydele and Thrasios (K&T) deck I’m going to evaluate what my commanders are doing, and consider some possible meta-game restrictions. First is Kydele who is a powerful source of colorless mana, and she wants to be drawing a lot of cards in a turn. So one of my first goals with this deck is to draw a ton of cards, to ensure Kydele is at her most powerful. Thrasios on the other hand is a mana sink, and a card advantage engine. Here we see that Kydele and Thrasios have some innate synergies just between the two cards. We strive with this build to draw a lot of cards, and have some good colorless mana outlets. Regarding the meta-game restrictions, I want this deck to be really powerful since my shop can be competitive at times. However, we tend to avoid decks that combo before turn eight, or that create infinite combos. These are the factors to keep in mind as I build this deck. The goal setting step is essential, in that we want to know what we are trying to accomplish. When we are done with our deck, we want to be able to look back and see that our goals for the deck were met. Once we have our inspiration and goals for a deck, we will begin the deck building process. I recommend using an online deck building resource to make the whole process faster and helps in later steps. I personally love the drag and drop function on deckstats.net, but use whatever works for you. The first cards that we want to place in our deck, are cards that have the most direct synergy with our commanders. However we may be new to magic or to EDH, and need a little guidance on what cards can help facilitate our goals. There is no better place to begin our search than the EDHREC page for our particular commander(s). When we pull up the signature cards for our commanders, we will immediately see some easy inclusions that have powerful interactions with our commanders. For example on the commander page for K&T, there are some cards that let us draw more than one card a turn. Cards like Brainstorm, Windfall and Sylvan Library are solid role players. These cards can fuel Kydele and can accomplish some of the goals we set out with. We want to look for cards with high synergy primarily to ensure our deck is cohesive, and our commanders have high utility in our deck. I’d like to highlight a few synergistic cards, and discuss how they will inform my deck building process. Kiora’s Follower and Thousand-Year Elixir were among the top cards on EDHREC for Kydele and Thrasios. They have some powerful interactions with Kydele. They allow us to untap and use her ability multiple times in a turn, producing obscene amounts of mana. This is a powerful interaction, and we may want to exploit it going forward. These synergistic cards broaden what the deck is trying to do. As we continue to build, we want to keep track of the interactions we like. Eventually these interactions develop develop into the themes and sub-themes of the deck. We want to build a strong foundation for our deck, one that uses our commanders to their fullest potential. Once we have this, we can begin to explore different avenues for our deck go down. This will begin the process of broadening the pyramid. We begin narrow and focused, so that our deck feels cohesive. Now that we have that solid framework, we need to diversify and cement what we have already have created. We will do this by fully exploring each theme and sub-theme of the deck. The cards we chose going forward will start to feeling like puzzle pieces, filling in gaps in our deck. It will almost feel as if the deck is building it self. In this K&T deck untapping Kydele, the Landfall mechanic, and wheel effects are my three sub-themes. All of these effects essentially allow us to go off, producing obscene amounts of mana and giving us options of what to do with it. To fully explore any one sub-theme I suggest going as deep as possible. Look at a single card in a sub-theme, and use EDHREC to see what cards are commonly played with it. This helps develop the themes fully. Gatherer is another helpful resource during this stage of the building process. Using a simple rules text search like “untap” + “creature”, can show us hundreds of potential cards to use in a sub-theme. For example I found Pemmin’s Aura and Freed From the Real, from this kind of search. When we look at the breadth of our options, we can start to narrow down each sub-theme, and find the cards that best suit our particular strategy. Once we have fleshed out our sub-themes, we need to consider how we will win the game. Some win conditions will have potentially been established in the previous steps, but here is where we will focus on them heavily. We need to reflect on our goals and themes. Will any of these things win a game outright? If so we should be focusing on those themes, and solidly a game plan to deploy those win conditions. If our current themes don’t already have win conditions associated with them, we need to map out potential paths to victory. How will we accomplish this? We need to look at what our deck providing us, and think of how we can best use that to win the game. For example, in the case of my K&T deck, Kydele gives us access to huge swaths of mana. However, without something effective to use it on, we will be unable to win the game. Thrasios ramps and draws cards, but this ability won’t win the game alone. What we can gather is that we have powerful engines, but are lacking in end game potential. We will most certainly be able to draw our win condition, and we will certainly have plenty of mana to cast them. 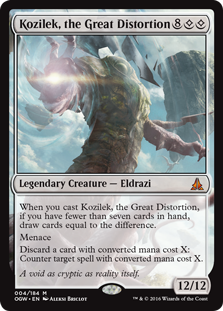 Well, after some thought and looking around K&T’s commander page, I found the perfect place to dump colorless mana; the Eldrazi. The Eldrazi Titans are a natural fit for our deck. These gigantic kill machines are huge game ending spells with powerful abilities, and most importantly they are colorless. With Kydele we will be able to get them out faster than most decks, and we should be able to protect them fairly well, seeing as most have ways to protect themselves. We may also want to consider a few non combat based win conditions. Sometimes combat just isn’t viable, and we will need ways to win a game without it. Again we need to think about what our deck is providing us, and utilize it. I like Helix Pinnacle in this spot. With how much mana we will have, it’s feasible that we can make 100 mana in one to two turns. During this step in the process we want to really hammer in our goals and themes. Our win conditions should feel like a natural evolution of what we have been doing up to this point. They will allow our deck to be more than just a pile of themes and synergies. Instead our deck will be an inevitability engine, that if left unanswered will take over the game. At this point the deck is mostly done, there are however some things that we need to attend to. We are missing our ramp, control, mana base, and utility packages. Every deck need these kinds of cards, and while they are not unique to this strategy, they will be fundamental to how the deck functions. While this is not the most exciting step, it is one of the most crucial. We have entered the most broad aspect of our deck, but it will fill any gaps left from deck construction. For ramp we will need to have a variety of mana rocks, mana dorks, and ramp spells. Some strategies will prefer one kind of ramp over another for various reasons. Creature based ramp is better in decks that care about having creatures. However they are more vulnerable to board wipes and removal. Mana rocks will be better in decks that can untap artifacts, or in decks that like to play mass land destruction(not that any of you would do that). Ramp spells are the most stable but the least abusable. For this deck we will play an assortment of all of these. 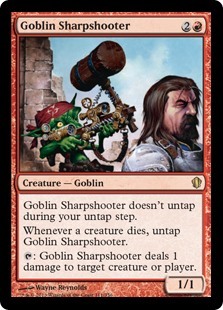 However ramp spells trigger landfall, so we will primarily using these spells as our ramp package. Every deck needs some aspects of control via counter-spells, spot removal, and board wipes. Some color combinations will be stronger for this than others. We will be running a few mass bounce spells, and some choice permanent removal spells. Green and Blue aren’t great colors for wipes and spot removal, but they do have some high quality counter spells. We will also need some amount of utility cards. This is where tutors, repeatable card draw, and other utilities such as equipment come in. There is a factor of demising return for these kinds cards. We want to be selective and only run what we need. Here are some rough guidelines on the numbers of utility cards you may consider running. Ten forms of mana acceleration will be sufficient in most decks. Blue deck may run from three to six counterspells. I generally like having three to five spot removal spells, as well as three to four board wipes. Card draw can be highly variable regarding the exact numbers, but every deck needs forms of card advantage. There many different forms of card advantage. Some decks will rely on enchantments such as Phyrexian Arena, while others will have powerful draw spells like Treasure Cruise. Regardless of how you are gaining that card advantage, you will want about seven to ten cards able to net you card advantage. A good mana base will make or break a deck. When building a deck’s mana base we want to consider the number of land we are running as well as the making sure your color ratio is correct. Lands can be a controversial subject in EDH. Many players run too many, and many will run to few. Both will assert that they run the correct number of lands. In the end it is dependent on the needs of the particular deck. A good rule of thumb is to start a list with 36-39 mana producing lands. I recommend also playing three-five utility lands that don’t have to necessarily produce mana. Reliquary Tower, Maze of Ith and Glacial Chasm all fall into this category. We want to build our entire mana base during this step, but I will cover creating the correct color mana distribution in the next step. I wouldn’t worry about that as much during this step. For my K&T deck, the mana base was pretty straightforward. I looked at the popular dual lands for the colors, and a few popular utility lands. 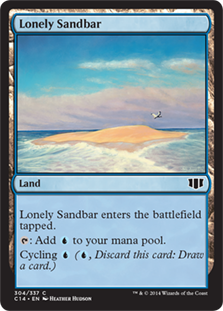 Some cool utility lands for this deck are lands that have the cycling mechanic. They trigger Kydele and help us dig deeper into our deck if we need to. I’m actually a huge fan of these lands in general, and they feel like a natural fit for this deck. 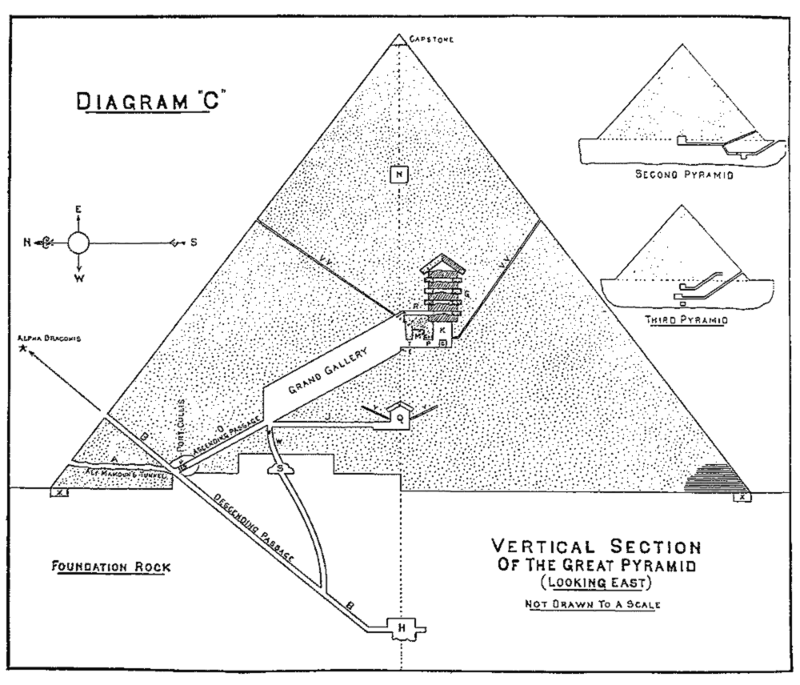 Here we are at the final step of Pyramid Theory. Here we take a look at the 100+ card deck we have created. It is now time to analyze the deck and refine it. We will need some tools for analysis, I recumbent using the same site you have been building the deck on. I will use deckstate.net to view a few key elements. Here is what the deckstats analysis of the deck looks like. Some of the things that I like to focus on while refining a deck are its mana curve, and its mana distribution vs mana source distribution. 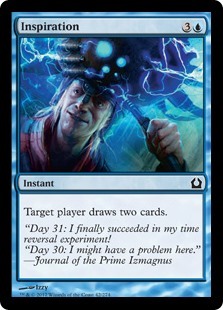 You see here I have a pretty nice curve, that peaks around converted mana cost(CMC) three. The average CMC of your deck should be between three and four. As your average CMC begins to approach five the deck will be just too slow to get much done. This is where I would begin the refinement process. Groom the curve of your deck, so that your deck logically transitions from one CMC to the next. If you have a ton of high CMC cards you may want to trim down for a few more utility cards. Mana distribution vs mana source distribution will also be important. Analyzing this becomes more important the more colors you end up playing. You will see here I have many more blue card than green, but my mana source distribution doesn’t reflect that. In some decks you may want those pie charts to match up as perfectly as possible. You will need to account for your commanders however. If you want to play your commander on curve every game of the game you may need to squee your mana base somewhat. This can enable you to play them consistently. I’ve squeed my mana base in this way so I can hopefully cast Thrasios and Kydele as soon as possible. If you still are at 100+ cards this is also the step were you want to shave it down to your final 100 cards. Evaluate your goals for the deck once again. Are the cards you’ve selected effective in supporting your themes? Some other advice I have for cutting is to be merciless. I believe Jimmy and Josh of the Command Zone refer to it as killing your darlings. Recognize when pet cards just aren’t going to fulfill the goals of the deck. Beyond just these simple adjustments, the final steps of analysis and refinement continue as you play the deck. You should periodically plug this same data in after months or even years of play to see what else can be done. Look at your pyramid and always strive to improve it. I hope you all found this article informative and useful. Here is the final list I ended up with for my Kydele and Thrasios deck. Mitchell started playing magic in Theros block, and hasn’t stopped since. He is largely concerned with the nuts and bolts of EDH, and the deck building process. When he isn’t playing magic, he is an undergraduate student studying political science.